This past month the percentage of BlackBerry 10 users with a physical keyboard reached an all time high at 37.2% of the market. This number has been trending upwards for the past half year, and is only likely to accelerate when the BlackBerry Passport and Classic launch in the fall. 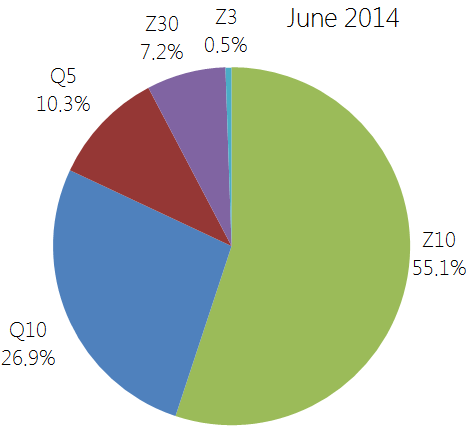 Currently the BlackBerry 10 ecosystem is still dominated by the BlackBerry Z10 which accounts for 55.1% of BlackBerry 10 phones in use. 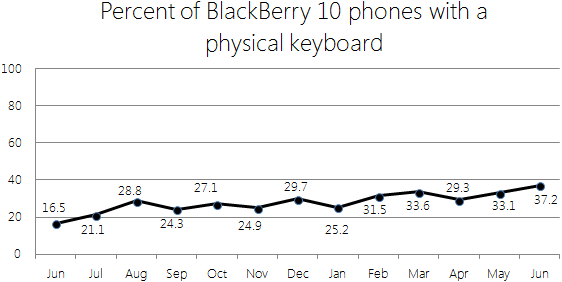 The most popular keyboard device is the BlackBerry Q10, but the Q5 has also seen a sudden boost in popularity, after lagging behind the Z30 for most of its life. All of these statistics are based off of the data collected by BlackBerry World for downloads of the free check-list app Stuff I Need (which is now also available for Windows Phone and Android users).